Like.com launched back in November 2006, with a shopping comparison site that enabled users to search for clothing and other fashion items by using both text and images as queries. Like.com aggregates a range of mainly clothing fashion projects from a number of US brands and retailers, including Amazon, Gap, Nike and Adidas. The number of partners has increased since the last time I looked at the site. For instance, a search for ‘men’s shoes’ produces results from 100+ retailers. Shoppers are redirected to these partner retailers’ website to complete their purchases, and Like.com takes a cut from these transactions. Like.com provides users with plenty of options to navigate around the site. Users can type keywords into the search box, use the top navigation bar, search by brand / category / popular search terms, or by visual search. The man navigation options are nice and comprehensive, though the drop down menus can be annoying, and the site works well when you browse through it this way. However, if you have a specific colour or style in mind, using visual search is the best option for finding products. 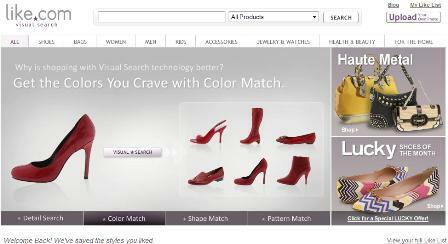 Shoppers can use Like.com’s visual search technology in a couple of different ways. Having selected these options, you then need to enter your email address and wait for your search results. This is the drawback with this kind of search, it can take up to 24 hours to get a reply. That said, I received my search results by email within six hours of submitting my request, and the results were pretty impressive. If you want to be more specific with the search, you can use the search tool to highlight a particular detail on the product and find similar features on other products. When you are displaying a wide range of products from a number of different retailers, then you need a way for shoppers to narrow down their searches and find relevant items more easily. For instance, a search for ‘men’s boots’ returns 5,400 results over 18 pages, which would be too many for most people to browse through. Fortunately, the filtering options on the site are excellent. I can narrow down my search by selecting different styles of boots, colours, materials, brand, retailer, as well as price range. Having revamped earlier this year, Like.com is now an attractive and very useful shopping comparison site, managing to display a large range of products whole still making them relatively easy to search and browse through. It seems that the website is working for Like.com too; its traffic has increased recently, up from 3m monthly unique visitors in February this year, to 5m last month. According to VentureBeat, Like.com is set to outstrip its targets for revenues this year, while the company has also received more money from Menlo Ventures to add to the $19.5m it raised before launch. Electrical retailer Comet has this week introduced a new beta version of its homepage, asking for user feedback on the new design. We talked to Comet’s Content Manager Robbie Tutt about the thinking behind the new homepage. 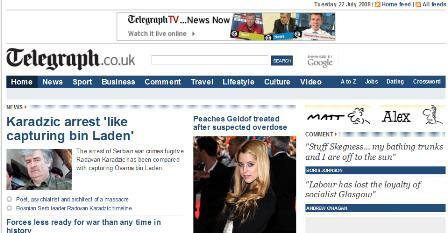 Telegraph.co.uk unveiled its new look website this week, with the stated aim of increasing the number of pages each visitor views on the site.